A closely watched measure of future economic activity fell in August for a third consecutive month, reflecting an uncertain climate for both businesses and consumers. Also Thursday, the Labor Department reported that the number of Americans filing new claims for unemployment insurance rose by a seasonally adjusted 14,000 to 350,000, mostly as a result of the hurricanes that hit Florida. That left claims at a higher than the 338,000 applications that some analysts were forecasting. But they remain lower than for the same week last year, when claims were at 387,000. The Conference Board said Thursday its Composite Index of Leading Economic Indicators fell 0.3 percent in August to 115.7, following a decline of 0.3 percent in July. The August reading was the third month of decline in the index, after a year in which it gained steady ground. The drop last month was larger than the 0.2 percent decrease forecast by analysts. "The leading indicators continue to soften," said Ken Goldstein, an economist for the New York-based Conference Board, a private research group. "Consumers worry about their wages and salaries which could limit spending. Businesses worry about their ability to raise prices and to cover rising costs." The index is closely followed because it is designed to forecast the economy's health over the coming three to six months. In its report, the Conference Board said seven of the 10 indicators that make up the index declined in August. They included interest rate spread, building permits, the index of consumer expectations, manufacturers' new orders for nondefense capital goods, vendor performance and stock prices. The components that rose were manufacturers' new orders for consumers goods and materials, real money supply and average weekly claims for initial unemployment. The index of coincident indicators, which measures the current economy, rose 0.2 percent in August to 117.8, with all four of its components increasing, after an identical increase in July. The index of lagging indicators, which looks back at the past six months, declined 0.1 percent in August to 98.2, with four of its seven components rising. 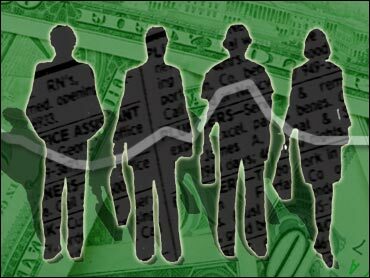 Thursday's employment report also showed that the number of people continuing to collect unemployment benefits rose by 5,000 to 2.88 million for the week ending Sept. 11, the most recent period for which that information is available. A year ago, the number of people continuing to draw claims was 3.57 million. Last week's increase left claims at a higher than the 338,000 applications that some analysts were forecasting. Still, when compared with the same week last year, the layoffs picture looks somewhat better. A year ago, claims stood at 387,000, versus the current 350,000. Citing some improvements in the economy, the Federal Reserve on Tuesday boosted a key short-term interest rate by one-quarter percentage point to 1.75 percent, its third increase this year. The Fed said that after a slowdown in economic activity in the late spring, the economy appeared to have "regained some traction and labor market conditions have improved modestly." The nation's payrolls picked up in August, expanding by 144,000, the most since May. Still, the economy is down a net 913,000 jobs since President Bush took office in January 2001. That marks the only time that the U.S. economy had fewer jobs at this point in a presidential term than it did in the beginning, over the 16 full presidential terms covered by Labor Department statistics, which go back to 1939. In August 2000, for example, there were 10 million more jobs than at President Clinton's second inauguration, and 20 million more than at his first. The first President Bush saw 1.8 million jobs created during the first 43 months of his only term. Ronald Reagan's terms created more than 9 million jobs between January 1985 and August 1988, and more than 3 million between January 1981 and August 1984. Mr. Bush says making his tax cuts permanent will strengthen the economy and help job creation. His Democratic rival, John Kerry, says the president's tax cuts mainly helped the wealthy and haven't spurred significant job growth. Congress, meanwhile, was moving ahead on a package extending several popular middle class tax cuts, which would provide Mr. Bush with a major legislative victory in the closing weeks of the presidential campaign.